How is the writing going? That’s great! How am I doing? Well, I’m busier than I would like to be. But aren’t we all? I know. Usually, I write to Murdock about a book I have read. And if he was not so busy with the rest of the A-Team at the moment, I suppose I would be writing to him. But he’s out with Hannibal, “on the jazz,” and I don’t know when he’ll be back. You don’t mind if I write to you since I can’t reach him, do you? There is a book I know of which you may want to hunt up. It is called Dinotopia: The Land Apart From Time. I read it some time ago and have never forgotten it. The story is not too bad; it is a bit of a cross between The Swiss Family Robinson and The Lost World. See, in Dinotopia, dinosaurs never became extinct. After some years of living quietly on the island, they had visitors: humans washed up on the shore after their ships were wrecked. These vessels either crashed and wrecked on the reef surrounding the island, or were damaged in the storms that encircle Dinotopia 24/7. Some humans found ways off of Dinotopia. But most stayed, making a new civilization with the dinosaurs. This new civilization (like its language) is an amalgamation of all the other known societies on the planet. The dinosaurs add their own elements to the culture, including their language, known in the story as Saurian. Yes, you guessed it. This is a language of chirps, hoots, and any other sounds that dinosaurs can make. The sounds humans cannot replicate themselves are imitated by other means. All in all, though, the story is not quite what fascinated me. Why? Well, we will have to go back a bit in order for me to explain. 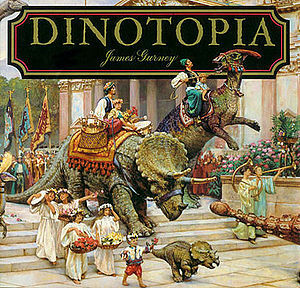 The author of Dinotopia is James Gurney, an artist for National Geographic. Dinotopia is largely composed of his fantastic paintings and sketches of life in the fictional land of Dinotopia. He draws the dinosaurs, the landscapes, the people, and the buildings. This is what stayed with me after reading Dinotopia. The drawings are not just beautiful; they get the mind whirling with possibilities. What would it be like to live amidst waterfalls (such as in the Dinotopian metropolis Waterfall City)? How about making a bridge designed after a dinosaur’s (or other vertebrate’s) backbone? What about making gliders designed to resemble real flying creatures? This is what stayed with me. The artwork often stays with me after reading any kind of fiction, but specifically Dinotopia. And this makes me ask this question: When was the last time anything was built beautifully? I do not mean beautifully safe, or beautifully perfect. I mean beautiful. Take the example of, say, the Chrysler building. It is a unique skyscraper with engravings and gargoyles on its outside. And it has a spire reaching for the sky, almost like a needle at the top of a block tower. Then there is the Space Needle in Seattle, the Lincoln Memorial, and countless other landmarks around the world. I have seen a lot of different skyscrapers. Some are unique in their own way; a few are even beautiful. But after a while, I feel that if you have seen one skyscraper, you have seen them all. Over the years skyscrapers have become nothing but pillars of steel and glass. There is very little to distinguish one skyscraper form the other; very little that makes them anything more than giant metal, glass-encased obelisks. Cities across the globe are, after a point, full of nothing but glass Lego towers. Apartment buildings and condominiums have the same problem. Walking around in such neighborhoods one gets the feeling they are stuck in a world of cardboard boxes. The buildings on the left side of the street are often (not always, but often) the mirror image of the buildings on the right side of the street. This lack of individuality, flair, cheerfulness, etc., has not only largely invaded the world of architecture, it has crept into other ways of life, too. Cars and trucks, for instance, are no longer built for size or beauty. Now, instead of being spacious and appealing eye-candy, cars and trucks across the country are nearly clones of each other. One can hardly tell the difference between a Chevy Suburban and a GMC Yukon. I cannot tell the difference between a Toyota Corolla and most Ford sedans. Only minute details proclaim the distinction between vehicles, excepting the names on the vehicles’ sides and the emblems blazoned on their grills. All in all, I cannot help wondering whether or not the people who build the skyscrapers, the architects for those skyscrapers, or the designers for vehicles, have ever read anything other than their handbook materials since they went into business. They are all buried in a dull anthill pattern of life that simply builds because that is how they win their bread. There are no longer many personal touches added to the hoards of buildings being constructed presently, nor are designers stamping the vehicles they churn out every day as notable standouts from the crowd. It is a pattern of these artists own weaving; as such, only they can find a way to change it. I know that, Meggie. I am not unsympathetic. I know that contractors, architects, and designers have to follow safety guidelines. I certainly would not want someone to build an ‘abstract’ skyscraper, with one floor jutting out to the left and the next one up jutting out to the right. I definitely do not want to see an apartment complex built to look like a mountain of sludge. I am not even sure that either suggestion would be geometrically possible. But there are creative touches that can be applied to these buildings and machines which are within the realm of geometric possibility, and which are within safety guidelines. There is proof of it all over the world. As I said, it is a pattern that these artists have chosen to weave for their lives. If they choose to march in identical uniforms, none but they can change their costumes. Therefore, I am glad that, in the realm of fiction at least, there are those who choose to weave brighter and better patterns for public consumption. I have to go. Maybe we could chat another time? This entry was posted in Youth Books and tagged Architecture, Arts, Book Reviews, books, dinosaurs, Dinotopia: A Land Apart From Time, Geometry, James Gurney, Painting, Youth Books on October 10, 2013 by The Mithril Guardian.